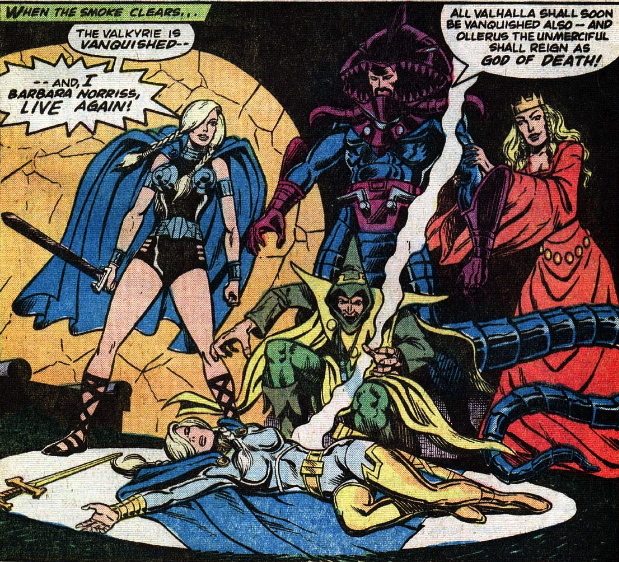 Believe it or not, I’m pretty sure this was Valkyrie’s first trip to Asgard–after years of being a “Norse” character. Valkyrie gets a big arc, in which she gets divided from her Barbara Norriss personality (who becomes evil-not sure why), and they fight for the realm of Valhalla. Issue #66 is all Val, and then the Defenders get recruited to help her. If you’re astute, you know that Valhalla is an afterlife realm for Asgardian heroes so, in order to get there, you have to die. So we get this bizarre scene of Nighthawk and Hellcat accidentally driving their vehicle off a cliff. Hulk gets crushed by a mountain. I’m not sure how he got to Valhalla, actually. Anyway, they “win” in the end and are restored to life, except for Babs who stays with Hela in Valhalla. It’s a lot of work just to separate Barbara Norris from Val.